Introduction: Milrinone at inotropic doses requires the addition of a vasoconstrictive drug. We hypothesized that terlipressin use could selectively recover the systemic vascular hypotension induced by milrinone without increasing the pulmonary vascular resistance (PVR) and mean pulmonary artery pressure (MPAP) as norepinephrine in cardiac surgery patients. Patients and Methods: Patients with pulmonary hypertension were enrolled in this study. At the start of rewarming a milrinone 25 μg/kg bolus over 10 min followed by infusion at the rate of 0.25 μg/kg/min. Just after the loading dose of milrinone, the patients were randomized to receive norepinephrine infusion at a dose of 0.1 μg/kg/min (norepinephrine group) or terlipressin infusion at a dose of 2 μg/kg/h (terlipressin group). Heart rate, mean arterial blood pressure (MAP), central venous pressure, MPAP, systemic vascular resistance (SVR), PVR, cardiac output were measured after induction of anesthesia, after loading dose of milrinone, during skin closure, and in the intensive care unit till 24 h. Results: Milrinone decreased MAP (from 79.56 ± 4.5 to 55.21 ± 2.1 and from 78.46 ± 3.3 to 54.11 ± 1.1) and decreased the MPAP (from 59.5 ± 3.5 to 25.4 ± 2.6 and from 61.3 ± 5.2 to 25.1 ± 2.3) in both groups. After norepinephrine, there was an increase in the MAP which is comparable to terlipressin group (P > 0.05). 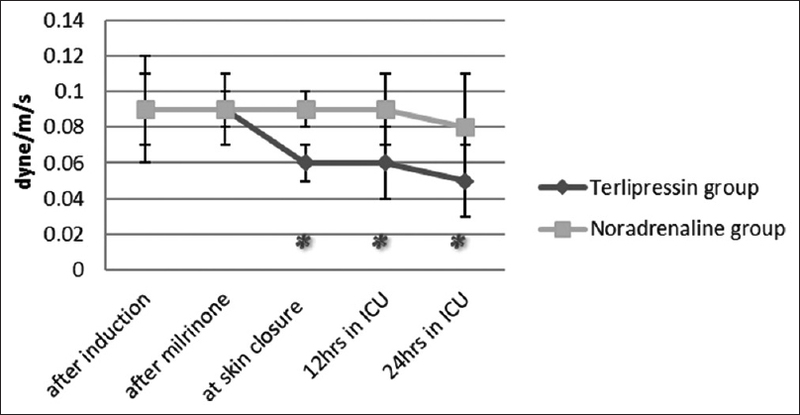 Terlipressin group shows a significant lower MPAP than norepinephrine group (24.5 ± 1.4 at skin closure vs. 43.3 ± 2.1, than 20.3 ± 2.1 at 24 h vs. 39.8 ± 3.8 postoperatively). There is a comparable increase in the SVR in both group, PVR showed a significant increase in the norepinephrine group compared to the terlipressin group (240.5 ± 23 vs. 140.6 ± 13 at skin closure than 190.3 ± 32 vs. 120.3 ± 10 at 24 h postoperatively). Conclusion: The use of terlipressin after milrinone will reverse systemic hypotension with lesser effect on the pulmonary artery pressure. The resulting pulmonary hypertension from valvular disease is a major risk factor for increased mortality and morbidity in patients undergoing cardiac surgery. Patients often show decrease in pulmonary pressure after surgical correction of valvular pathology due to the release of left-sided obstruction. However, residual pulmonary hypertension is either due to morphologic changes in pulmonary vasculature and/or increased pulmonary vasculature reactivity by various events during cardiac surgery. Therefore, therapy aims at preserving the right ventricular (RV) contractility and lower postoperative pulmonary pressure. Milrinone, a phosphodiesterase III inhibitor, is commonly used during postcardiopulmonary bypass (CPB) period to decrease pulmonary artery pressure with a synergistic positive inotropic effect. The phosphodiesterase III inhibitor usually leads to systemic vascular hypotension at inotropic doses and requires the addition of a vasoconstrictive drug as noradrenaline infusion., Although frequently used, these drugs have no selectivity on systemic vessels and may increase pulmonary vascular resistance (PVR) and pulmonary artery pressure. Vasopressin has been reported to be effective in restoring the systemic arterial pressure after septic shock, postcardiotomy hypotension, intraoperative paracentesis hypotension in cirrhotic patients, and maintain pressure in off-pump cardiac surgery for milrinone-induced hypotension. Terlipressin acts through the vasopressin system, which may be considered an important physiologic system for the regulation of arterial blood pressure. This long-acting synthetic analog of vasopressin has a half-life of 6 h and a higher vascular selectivity for vascular receptors compared with vasopressin. In this study, we hypothesized that terlipressin use could selectively recover the systemic vascular hypotension induced by milrinone without increased PVR and mean pulmonary artery pressure (MPAP) as norepinephrine in cardiac surgery patients with pulmonary hypertension. After institutional review board approval and written informed consent, patients scheduled for mitral and/or aortic valve replacement with pulmonary arterial hypertension (PAH) (an estimated RV systolic pressure ≥50 mmHg or mean PAP >40 mmHg or systolic PAP exceeding 50% of systemic systolic pressure) were enrolled in this study. Patients older than 70 years or younger than 20 years, emergency surgery, severe renal and hepatic dysfunction, uncontrolled supraventricular arrhythmia, or those requiring preoperative inotropes were excluded from the study. All patients received premedication with oral midazolam the day before surgery and intramuscular morphine 10 mg 1 h before surgery. In the operating room, all patients received routine monitoring consisting of a five-lead electrocardiography with ST-segment analysis, radial arterial pressure, pulse oximetry, capnography, and nasopharyngeal temperature probe. Anesthesia was induced with midazolam (0.1 mg/kg), propofol (1.5–2 mg/kg), fentanyl (15 μg/kg), and pancuronium bromide (0.1 mg/kg). Anesthesia was maintained until the end of operation with continuous infusions of fentanyl (1 μg/kg/h), propofol (1.5 mg/kg/h), and pancuronium bromide 0.05 mg/kg once each hour. A pulmonary artery catheter (Swan–Ganz, Edwards Lifesciences, USA) was inserted through the right internal jugular vein. All patients had valve replacement with mechanical prosthetic valve. During CPB, mild hypothermia (28°C–30°C) and antegrade cold crystalloid cardioplegic arrest with aortic clamping were used. Membrane oxygenators were used and flow rates of 2–3 L/min/m2 with 70–90 mmHg of systemic perfusion pressure. All patients were rewarmed up to 36.5°C nasopharyngeal temperature before separation of CPB. At the start of rewarming a milrinone 25 μg/kg bolus over 10 min followed by infusion at the rate of 0.25 μg/kg/min was started for all patients. Just after the loading dose of milrinone, the patients were randomized to receive norepinephrine infusion at a dose of 0.1 μg/kg/min (Norepinephrine group) or terlipressin infusion at a dose of 2 μg/kg/h (Terlipressin group) using the computer-generated number and sealed envelope method. The dose of terlipressin was selected based on the previous studies on terlipressin., The anesthesiologist was allowed to administer any other drug or inotrope in both groups if needed and is recorded. The study drugs infusions were continued for 24 h in the postoperative period. Hemodynamic variables such as heart rate (HR), mean arterial blood pressure (MAP), central venous pressure (CVP), MPAP, systemic vascular resistance (SVR), PVR, PVR/SVR ratio, and cardiac output (co) were measured after induction of anesthesia, after loading dose of milrinone, than at the end of surgery during skin closure. Postoperatively, the hemodynamic data are measured in the intensive care unit (ICU) every 6 h till the first 24 h. Blood samples were collected and analyzed for serum lactate concentration and mixed venous oxygen saturation although the study. Transesophageal ehocardiography (TEE) examination was performed during the intraoperative period using S7–S2 Omni TEE probe (Philips Healthcare, WA, USA), in addition, transthorasic echocardiography (TTE) was also performed 12 and 24 h postsurgery using Philips iE33 Echocardiography System (Philips healthcare, WA, USA). Echocardiographic parameters measured tricuspid annular plane systolic excursion (TAPSE) and RV Tie index for the assessment of RV function. The duration of mechanical ventilation, ICU stay, and hospital stay were recorded for all patients. Fifteen patients in each group would be required to detect a difference of 5 mmHg in mean PAP, with an alpha error of 0.05 an beta error of 0.2. We enrolled 20 cases in each group. Statistical analysis was performed with SPSS software version 17.0 (SPSS Inc., Chicago, IL, USA). All data were tested for normality using Kolmogorov–Smirnov test. Values were expressed as mean ± standard deviation (SD) and median ± range as appropriate. Continuous variables between two groups at various time points were compared using independent t-test for parametric data and Mann–Whitney U-test for nonparametric data. For categorical variables, comparisons were done using Chi-square test or Fisher's exact test. P < 0.05 was considered statistically significant. From fifty patients who were screened for enrollment in this study, 40 patients fulfilled inclusion criteria and completed the study. The demographic and preoperative clinical data for all patients were comparable [Table 1]. Values are expressed as mean ± SD or n (number of patients). There were no significant differences between the two groups (P > 0.05). Baseline systemic and pulmonary hemodynamic variables were similar after induction of anesthesia for all patients. Milrinone infusion decreased MAP (from 79.56 ± 4.5 to 55.21 ± 2.1 and from 78.46 ± 3.3 to 54.11 ± 1.1) (P < 0.05) and decreased the MPAP (from 59.5 ± 3.5 to 25.4 ± 2.6 and from 61.3 ± 5.2 to 25.1 ± 2.3) (P < 0.05) in both groups. As regard CVP, no comparable changes after milrinone compared to baseline reading. There was a slightly increase in HR of no statistical significance after milrinone in both groups. There was also a decrease in the SVR (from 2639.0 ± 456 to 1446.3 ± 321 and from 2732.432 ± 432 to 1455.7 ± 311) (P < 0.05) [Table 2] and a decrease in the PVR (from 253.3 ± 56 to139.5 ± 32 and from 260.3 ± 48) (P < 0.05), respectively, in both groups [Figure 1] and [Figure 2]. However, the PVR/SVR ratio after milrinone infusion is comparable to the baseline PVR/SVR ratio in both groups (P > 0.05) [Figure 3]. 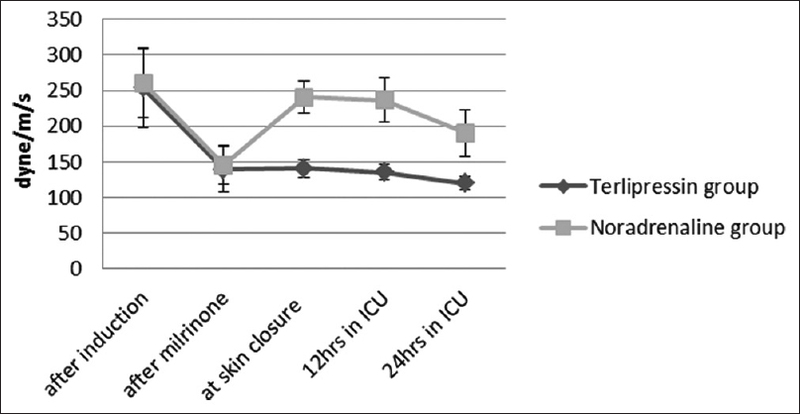 After norepinephrine infusion and throughout the 24 h postoperatively, there was an increase in the MAP (from 54.11 ± 1 to 84.15 ± 5.3 at skin closure, then 87.21 ± 3.2 at 24 h), these reading were comparable to terlipressin group (P > 0.05). Norepinephrine group showed increase in the MPAP (from 25.1 ± 2.3 to 43.3 ± 2.1 at skin closure, then 39.8 ± 3.8 at 24 h) (P < 0.05). 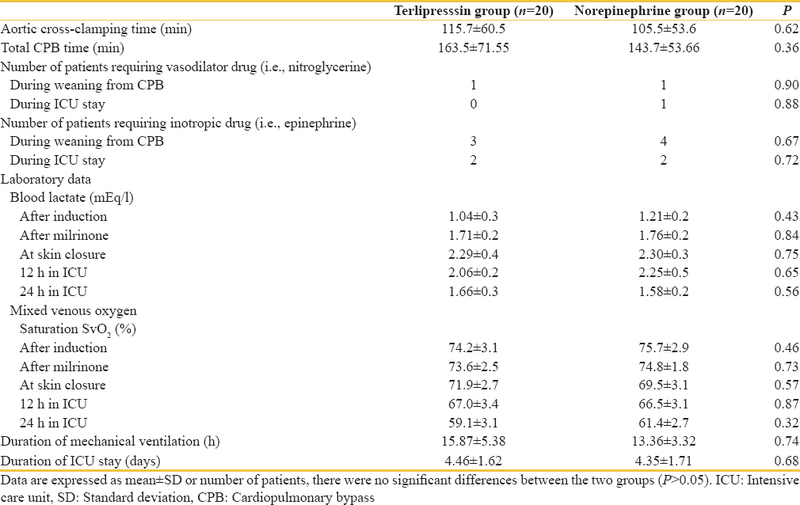 Terlipressin group shows a significant lower MPAP than norepinephrine group (24.5 ± 1.4 at skin closure vs. 43.3 ± 2.1, then 20.3 ± 2.1 at 24 h vs. 39.8 ± 3.8 postoperatively in norepinephrine group) (P < 0.05) [Table 2]. There is a comparable increase in the SVR in both group (from 1446 ± 321 to 2454 ± 243 at skin closure, then 2426 ± 301 24 h) in terlipressin group versus (from 14557 ± 311 to 2645 ± 251 at skin closure, then 2434 ± 257 at 24 h postoperatively). The PVR showed a significant increase in the norepinephrine group compared to the terlipressin group (240.5 ± 23 vs. 140.6 ± 13 at skin closure, then 190.3 ± 32 vs. 120.3 ± 10 at 24 h postoperatively) (P < 0.05) [Figure 1] and [Figure 2]. 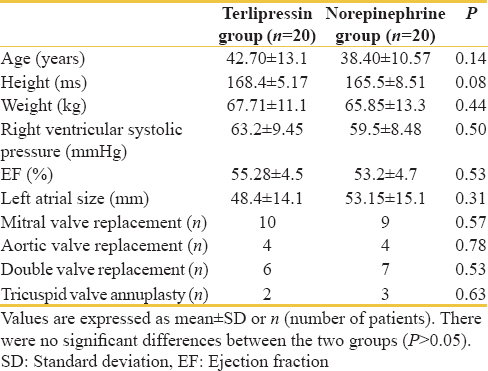 Terlipressin group patients showed a significantly lower PVR/SVR ratio compared to norepinephrine group (P < 0.05) [Figure 3]. As regard CO, there was a significant increase from baseline after milrinone infusion (from 4.0 ± 0.4 to 5.5 ± 0.8 in terlipressin group and from 4.1 ± 0.5 to 5.4 ± 0.9 in norepinephrine group), this is comparable in both group throughout the study. The need for other vasopressor or inotropic drugs was also comparable between both groups [Table 3]. Optimum echocardiography assessment could not be done in two patients (one in each group) due to poor echo window. Echocardiography data were analyzed for remaining 38 patients. TAPSE and RV Tei index were comparable between both the groups at all time points; however, after milrinone infusion, there was a significant improvement in TAPSE (from 18.2 ± 0.2 to 24.3 ± 0.2 in terlipressin group and from 18.99 ± 0.3 to 23.3 ± 0.2 in norepinephrine group) with lower RV Tei index (from 0.65 ± 0.18 to 0.40 ± 0.3 in terlipressin group and from 0.66 ± 0.46 to 0.42 ± 0.2 in norepinephrine group) compared to baseline values. A lower reading is recorded in the terlipressin group but of no statistical importance [Table 2]. Laboratory values (serum lactate, mixed venous saturation) were comparable throughout the study. The time on mechanical ventilation and the duration of ICU stay were similar in the two groups [Table 3]. In this study, we found that the administration of milrinone decreased both the pulmonary and the systemic pressure with decrease in both the PVR and SVR. The use of terlipressin reverses the systemic vascular hypotension induced by milrinone with less effect on the pulmonary vasculature pressure, and thus the MPAP and PVR/SVR ratio are decreased compared to norepinephrine use. Valvular disease of the heart causes left ventricular dysfunction, and this may lead to pulmonary hypertension. Pulmonary hypertension is an important reason for increased mortality and morbidity in such patients. Prognosis is determined by adaptation of the right ventricle to this pulmonary hypertension and the presence of residual PAH after valve surgery. Therefore, therapy aimed at preserving RV contractility and lower postoperative pulmonary artery pressure would give better results for these patients. Milrinone, a phosphodiesterase III inhibitor, is commonly used during post-CPB period in combination with noradrenaline to decrease pulmonary artery pressure and to provide a synergistic positive inotropic effect in the presence of β-adrenoreceptor downregulation induced by the CPB., In the previous studies, milrinone has proved to be effective during CPB weaning due to its positive inotropic as well as it reduced the SVR and PVR with intrinsic cardiac muscle recovery, thus provides adequate cardiac performance for patients with residual pulmonary hypertension after cardiac surgery.,, PDE III inhibitors usually cause hypotension attacks at inotropic doses. Maintaining the systemic pressure is as important as well as reducing the RV afterload in the management of right heart failure with pulmonary hypertension. The right coronary blood flow occurs throughout the cardiac cycle; thus, as the PVR approaches SVR, coronary perfusion will decrease. Therefore, increasing the SVR using vasopressors in the setting of increased RV afterload, the right coronary flow will increased and RV ischemia is reversed. Thus, milrinone use often requires vasoconstrictors to prevent unwanted arterial hypotension. Although catecholamine vasopressors have been frequently used to treat milrinone-induced hypotension, these are nonselective on systemic vessels and may increase PVR and increase pulmonary artery pressure. Loading dose of milrinone 50 μg/kg may result in severe hypotensive attacks following cardiac surgery. Several authors studied several doses of milrinone and it is proved to cause hypotensive episodes even at low doses.,, Milrinone in a low loading dose of 20 μg/kg may cause hypotensive attack in 30% of patients compared to 90% with higher dose of 40 μg/kg. Systemic hypotension should be treated vigorously in these patients, the ideal drug being one which increases the systemic arterial blood pressure (SBP) but producing minimal effects on pulmonary arterial pressure. A number of studies in animal models or in patients with acute and pulmonary hypertension have reported that norepinephrine and other vasoconstrictor as phenylephrine may effectively increase SBP with an increase in cardiac output.,,,, Norepinephrine is a potent α-adrenergic vasoconstrictor and a relatively mild β-adrenergic agonist with a mild inotropic effect. The potent vasopressor effect of norepinephrine is primarily due to increased peripheral vascular resistance mediated through both the α1 and α2 postsynaptic receptors. Activation of these receptors causes pulmonary vasoconstriction therefore increasing the PVR and the PAP., In adults with septic shock, higher doses of NE increase PVR/SVR without worsening RV function. Norepinephrine is positively inotropic through β-1 receptor agonist, thus improving RV/pulmonary arterial coupling, CO, and RV performance in acute RV dysfunction due to pulmonary hypertension.,,, In this study, the infusion of norepinephrine after milrinone recover the decreased in both the SVR and PVR without affecting the ratio PVR/SVR between them, thus increasing the PAP in these group patients compared to terlipressin group. Terlipressin is a synthetic analog of vasopressin. In fact, it is a prodrug that is rapidly converted by endopeptidases to lysine vasopressin, which binds to specific V1 receptors on the vascular smooth muscle. Endogenous vasopressin is released from the posterior pituitary in response to increased serum osmolality or reduced plasma volume. Under normal conditions, the major physiological role of vasopressin is the regulation of water balance with a lesser role in the vascular regulation of blood pressure. However, in shock states, the endogenous release of vasopressin is an important vasoconstrictor mechanism and vascular response to “exogenous” vasopressin is much more enhanced.,,, Terlipressin is characterized by greater selectivity for the V1 receptor than vasopressin, and therefore, has a stronger vasopressor effect. Terlipressin is used to treat the acute episodes of esophageal bleeding in cirrhotic patients. Terlipressin has a longer duration of action compared to vasopressin (the half-life of terlipressin is 6 h and that of vasopressin is 24 min. In this study, terlipressin showed selective vasoconstriction on the systemic vessels with a less effect on the pulmonary vessels. There was a reversal to the vasodilator effects of milrinone on the systemic vascular system with a decrease in both the MPAP and the PVR/SVR ratio in the terlipressin group compared to the norepinephrine group. Vasopressin and terlipressin in addition to systemic vasoconstrictor effect mainly on splanchnic circulation, provokes vasodilatation in some vascular regions as cerebral and pulmonary circulation. The mechanism of this vasodilatation can be explained by production of NO at the level of the endothelial cells. The receptors involved have not been clearly identified. It has been shown that vasopressin provokes vasodilatation of the pulmonary artery both under physiological and hypoxic conditions, and this effect was mediated by V1 receptors and endothelium-derived nitric oxide,,, the PVR was not increase until a high level of vasopressin concentration was reached (300–500 mg/ml). Many previous clinical studies, analyzed the effects of vasopressin on for systemic blood pressure and SVR, however, the effect on the pulmonary artery pressure and PVR is not always inconsistent.,,,, Vasopressin infusion proved to a have a vasoconstrictor effect on the systemic vascular system and to lesser effect on pulmonary vascular system and thus decrease the PAP.,, However, in contrast to these results, Morelli et al. reported an increase of PVR by terlipressin in patients with catecholamine-treated hyperkinetic septic shock. Some explanation for these variations may be that vasopressin was infused in abnormal hemodynamic shock state and other important factors that affect the PVR and pulmonary artery pressure as temperature, volume status abnormality, and paCO2 level were not adequately control in such patients. Studies on cirrhotic patients suggest that terlipressin decreases the systolic pulmonary artery pressure is by reducing the blood flow in the pulmonary circulation. Selective vasodilator effect of vasopressin and its analog terlipressin on the vessels of brain and kidney as well as heart has been proved in many studies, as these organs are the targets of protective strategies in cardiac surgery, terlipressin may be more suitable for the management of milrinone-induced hypotension in such cases. The cardiac output value for both terlipressin and norepinephrine group were comparable throughout this study; in a resuscitation pig model, the vasopressin reduced cardiac index during the postresuscitation period. The vasoconstrictive effect of vasopressin and the subsequent decrease of cardiac output may be reversed by milrinone. This explained the mechanism of action of milrinone which is a phosphodiesterase III inhibitor. Echocardiographic assessment of RV function remains challenging because of complex right ventricle chamber. TAPSE is the most commonly used longitudinal function parameter index for assessment of right ventricle systolic function, Tei index is considered to be a load-independent parameter for the assessment of RV systolic and diastolic function. Tei index shows a good correlation with PVR drop after surgery in chronic thromboembolic pulmonary hypertension. In our study, the lower reading recorded is of no statistical significance. We concluded from this study that the use of terlipressin after milrinone in patients with pulmonary hypertension will reverse the systemic hypotension with a lesser effect on the PVR and pulmonary artery pressure. Tempe DK, Hasija S, Datt V, Tomar AS, Virmani S, Banerjee A, et al. Evaluation and comparison of early hemodynamic changes after elective mitral valve replacement in patients with severe and mild pulmonary arterial hypertension. J Cardiothorac Vasc Anesth 2009;23:298-305. Mishra A, Kumar B, Dutta V, Arya VK, Mishra AK. Comparative effect of levosimendan and milrinone in cardiac surgery patients with pulmonary hypertension and left ventricular dysfunction. J Cardiothorac Vasc Anesth 2016;30:639-46. Oztekin I, Yazici S, Oztekin DS, Goksel O, Issever H, Canik S, et al. Effects of low-dose milrinone on weaning from cardiopulmonary bypass and after in patients with mitral stenosis and pulmonary hypertension. Yakugaku Zasshi 2007;127:375-83. Vlahakes GJ, Turley K, Hoffman JI. The pathophysiology of failure in acute right ventricular hypertension: Hemodynamic and biochemical correlations. Circulation 1981;63:87-95. Belenkie I, Horne SG, Dani R, Smith ER, Tyberg JV. Effects of aortic constriction during experimental acute right ventricular pressure loading. Further insights into diastolic and systolic ventricular interaction. Circulation 1995;92:546-54. Landry DW, Levin HR, Gallant EM, Seo S, D'Alessandro D, Oz MC, et al. Vasopressin pressor hypersensitivity in vasodilatory septic shock. Crit Care Med 1997;25:1279-82. Talbot MP, Tremblay I, Denault AY, Bélisle S. Vasopressin for refractory hypotension during cardiopulmonary bypass. J Thorac Cardiovasc Surg 2000;120:401-2. Mukhtar A, Salah M, Aboulfetouh F, Obayah G, Samy M, Hassanien A, et al. The use of terlipressin during living donor liver transplantation: Effects on systemic and splanchnic hemodynamics and renal function. Crit Care Med 2011;39:1329-34. Jeon Y, Ryu JH, Lim YJ, Kim CS, Bahk JH, Yoon SZ, et al. Comparative hemodynamic effects of vasopressin and norepinephrine after milrinone-induced hypotension in off-pump coronary artery bypass surgical patients. Eur J Cardiothorac Surg 2006;29:952-6. Abdullah MH, Saleh SM, Morad WS. Terlipressin versus norepinephrine to counteractintraoperative paracentesis induced refractory hypotension in cirrhotic patients. Egypt J Anaesth 2012;28:29-35. Melby SJ, Moon MR, Lindman BR, Bailey MS, Hill LL, Damiano RJ Jr., et al. Impact of pulmonary hypertension on outcomes after aortic valve replacement for aortic valve stenosis. J Thorac Cardiovasc Surg 2011;141:1424-30. Denault A, Deschamps A, Tardif JC, Lambert J, Perrault L. Pulmonary hypertension in cardiac surgery. Curr Cardiol Rev 2010;6:1-14. Booth JV, Landolfo KP, Chesnut LC, Bennett-Guerrero E, Gerhardt MA, Atwell DM, et al. Acute depression of myocardial beta-adrenergic receptor signaling during cardiopulmonary bypass: Impairment of the adenylyl cyclase moiety. Duke heart center perioperative desensitization group. Anesthesiology 1998;89:602-11. Wang H, Gong M, Zhou B, Dai A. Comparison of inhaled and intravenous milrinone in patients with pulmonary hypertension undergoing mitral valve surgery. Adv Ther 2009;26:462-8. Konstam MA, Cody RJ. Short-term use of intravenous milrinone for heart failure. Am J Cardiol 1995;75:822-6. De Hert SG, Moens MM, Jorens PG, Delrue GL, DePaep RJ, Vermeyen KM, et al. Comparison of two different loading doses of milrinone for weaning from cardiopulmonary bypass. J Cardiothorac Vasc Anesth 1995;9:264-71. Hirsch LJ, Rooney MW, Wat SS, Kleinmann B, Mathru M. Norepinephrine and phenylephrine effects on right ventricular function in experimental canine pulmonary embolism. Chest 1991;100:796-801. Mathru M, Venus B, Smith RA, Shirakawa Y, Sugiura A. Treatment of low cardiac output complicating acute pulmonary hypertension in normovolemic goats. Crit Care Med 1986;14:120-4. Ducas J, Duval D, Dasilva H, Boiteau P, Prewitt RM. Treatment of canine pulmonary hypertension: Effects of norepinephrine and isoproterenol on pulmonary vascular pressure-flow characteristics. Circulation 1987;75:235-42. Calvin JE Jr. Acute right heart failure: Pathophysiology, recognition, and pharmacological management. J Cardiothorac Vasc Anesth 1991;5:507-13. Molloy WD, Lee KY, Girling L, Schick U, Prewitt RM. Treatment of shock in a canine model of pulmonary embolism. Am Rev Respir Dis 1984;130:870-4. Hanson EL, O'Connor NE, Drinker PA. Hemodynamic response to controlled ventilation during hypoxia in man and animals. Surg Forum 1972;23:207-9. Bergofsky EH. Humoral control of the pulmonary circulation. Annu Rev Physiol 1980;42:221-33. Morelli A, Ertmer C, Rehberg S, Lange M, Orecchioni A, Cecchini V, et al. Continuous terlipressin versus vasopressin infusion in septic shock (TERLIVAP): A randomized, controlled pilot study. Crit Care 2009;13:R130. Kerbaul F, Rondelet B, Motte S, Fesler P, Hubloue I, Ewalenko P, et al. Effects of norepinephrine and dobutamine on pressure load-induced right ventricular failure. Crit Care Med 2004;32:1035-40. Martin C, Perrin G, Saux P, Papazian L, Gouin F. Effects of norepinephrine on right ventricular function in septic shock patients. Intensive Care Med 1994;20:444-7. Argenziano M, Chen JM, Choudhri AF, Cullinane S, Garfein E, Weinberg AD, et al. Management of vasodilatory shock after cardiac surgery: Identification of predisposing factors and use of a novel pressor agent. J Thorac Cardiovasc Surg 1998;116:973-80. Dünser MW, Mayr AJ, Ulmer H, Knotzer H, Sumann G, Pajk W, et al. Arginine vasopressin in advanced vasodilatory shock: A prospective, randomized, controlled study. Circulation 2003;107:2313-9. Luckner G, Dünser MW, Jochberger S, Mayr VD, Wenzel V, Ulmer H, et al. Arginine vasopressin in 316 patients with advanced vasodilatory shock. Crit Care Med 2005;33:2659-66. Argenziano M, Choudhri AF, Oz MC, Rose EA, Smith CR, Landry DW, et al. Aprospective randomized trial of arginine vasopressin in the treatment of vasodilatory shock after left ventricular assist device placement. Circulation 1997;96:II-286-90. Scharte M, Meyer J, Van Aken H, Bone HG. Hemodynamic effects of terlipressin (a synthetic analog of vasopressin) in healthy and endotoxemic sheep. Crit Care Med 2001;29:1756-60. Scarpati G, Piazza O. Vasopressin vs. terlipressin in treatment of refractory shock. Transl Med Unisa 2013;5:22-7. Evora PR, Pearson PJ, Schaff HV. Arginine vasopressin induces endothelium-dependent vasodilatation of the pulmonary artery. V1-receptor-mediated production of nitric oxide. Chest 1993;103:1241-5. Russ RD, Walker BR. Role of nitric oxide in vasopressinergic pulmonary vasodilatation. Am J Physiol 1992;262:H743-7. Wallace AW, Tunin CM, Shoukas AA. Effects of vasopressin on pulmonary and systemic vascular mechanics. Am J Physiol 1989;257:H1228-34. Gold JA, Cullinane S, Chen J, Oz MC, Oliver JA, Landry DW, et al. Vasopressin as an alternative to norepinephrine in the treatment of milrinone-induced hypotension. Crit Care Med 2000;28:249-52. Dünser MW, Mayr AJ, Ulmer H, Ritsch N, Knotzer H, Pajk W, et al. The effects of vasopressin on systemic hemodynamics in catecholamine-resistant septic and postcardiotomy shock: A retrospective analysis. Anesth Analg 2001;93:7-13. Morelli A, Rocco M, Conti G, Orecchioni A, De Gaetano A, Cortese G, et al. Effects of terlipressin on systemic and regional haemodynamics in catecholamine-treated hyperkinetic septic shock. Intensive Care Med 2004;30:597-604. Altintas E, Akkus N, Gen R, Helvaci MR, Sezgin O, Oguz D, et al. Effects of terlipressin on systolic pulmonary artery pressure of patients with liver cirrhosis: An echocardiographic assessment. World J Gastroenterol 2004;10:2278-80. Suzuki Y, Satoh S, Oyama H, Takayasu M, Shibuya M, Sugita K, et al. Vasopressin mediated vasodilation of cerebral arteries. J Auton Nerv Syst 1994;49 Suppl:S129-32. Vanhoutte PM, Katusić ZS, Shepherd JT. Vasopressin induces endothelium-dependent relaxations of cerebral and coronary, but not of systemic arteries. J Hypertens Suppl 1984;2:S421-2. Rudichenko VM, Beierwaltes WH. Arginine vasopressin-induced renal vasodilation mediated by nitric oxide. J Vasc Res 1995;32:100-5. Prengel AW, Lindner KH, Keller A, Lurie KG. Cardiovascular function during the postresuscitation phase after cardiac arrest in pigs: A comparison of epinephrine versus vasopressin. Crit Care Med 1996;24:2014-9. Palmaers T, Albrecht S, Heuser F, Leuthold C, Schuettler J, Schmitz B, et al. Milrinone combined with vasopressin improves cardiac index after cardiopulmonary resuscitation in a pig model of myocardial infarction. Anesthesiology 2007;106:100-6. Vonk MC, Sander MH, Vander Hoogen HJ, VanRiel PL, Verheugt FW, Van Digk AP. Right ventricular Tei-index. A tool to increase the accuracy of non invasive detection of pulmonary arterial hypertension in connective tissue disease. Eur J Echocardiogr 2007;8:317-21. Menzel T, Kramm T, Mohr-Kahaly S, Mayer E, Oelert H, Meyer J, et al. Assessment of cardiac performance using Tei indices in patients undergoing pulmonary thromboendarterectomy. Ann Thorac Surg 2002;73:762-6.